Move the sliders to change the values of a and b in the function g(x) = af(bx). Describe in words the effects of a and b on the graph of y = g(x). 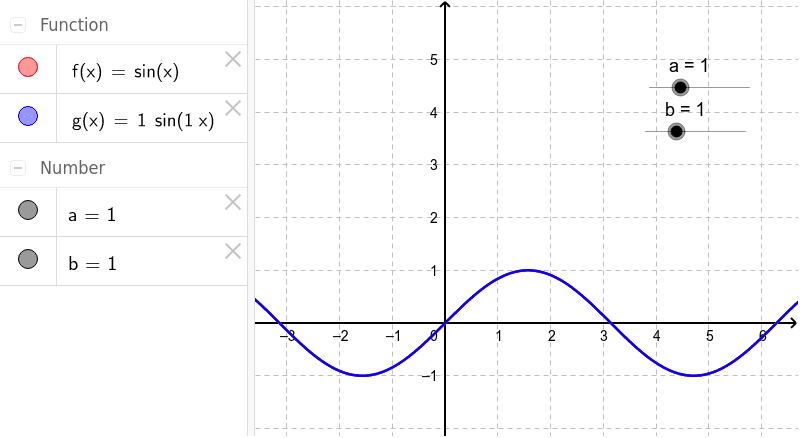 I.e., explain the transformation that takes the graph of y = f(x) to the graph of y = g(x). Now, double--click the f(x) function (in red) and change it to f(x) = 1/(x^2+1). Observe what happens to g(x). Why is this? What are the effects of a and b on the graph of y = g(x)? Double--click on f(x) and redefine it to another function of your choice. Observe what happens to g(x) and what the effects of a and b are on its graph.